The GS 175 from G3 is a brand new hull for 2010. Designed for the fishing enthusiast who wants to get on the water but also wants the entire family to enjoy time aboard, it has many features that suit both purposes. The family part makes the boat purchase an easier sell at home, too. This mid-console model has a full, centre-opening walk-through windshield. Three pedestal seats can be positioned in six different bases, with four in the cockpit and one each in the raised areas fore and aft. Two upholstered jump seats aft (with storage beneath), fold flat and out of the way when not required. Between these seats live the engine starting battery and accessory pumps. 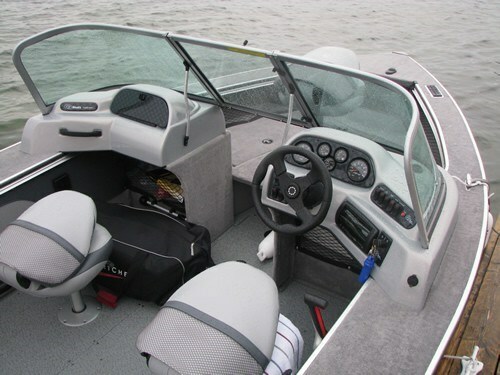 When the fishing gear is stowed away, the forward centre floor removes very easily with two latches, leaving the seating arrangement the same as on any family bowrider. Most seats have storage below; there's a live well, and a rod locker in the portside gunnel holds no fewer than seven full 7-foot rods. 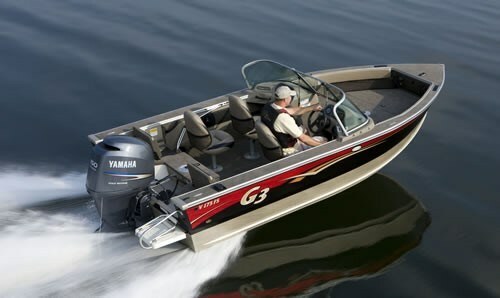 The wiring harness on this 2010 model is made by Yamaha to eliminate issues with quality or incompatibility, and includes pre-wiring for a trolling motor. Circuit breakers, not fuses, protect all circuits. A compartment for dual accessory batteries is located under the floor beside the helm seat, keeping that weight forward for better load balance. A bimini top, for hot sun protection or damp days, is part of the package and stows just forward of the rear seat when not in use. Floor covering is vinyl, which makes for a much easier clean up when fishing. For entertainment, a stereo with single disc and iPod jack hides under a waterproof cover. This fully equipped boat, ready to fish, ski, tube, or just enjoy the water package, includes a trailer. We tested the new hull with three adults aboard, full fuel and choppy conditions on Lake Couchiching in Central Ontario. New lifting strakes on this V hull helped reach planing speed in 4 seconds, which was pretty impressive for the load. While running in these conditions and doubling back through our own wake, the new reverse chines deflected all spray away from the occupants, for a dry ride. 3400 RPM, results in a 20 MPH cruise, and the G3 was riding on the aft one-third of the hull. 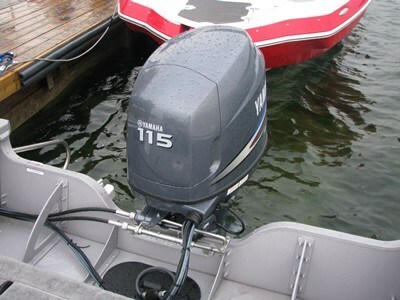 The 115 HP Yamaha, on a boat rated for maximum 150 delivered 44 MPH, again pretty good for the load. The only negative comment from your tester on this 17 footer was steering that was a little too stiff for my liking. When I commented on this concern I was informed that G3 has this issue covered, and for a very low price, hydraulic steering can be installed as a factory option. The cost for this option is too good to pass up, so I expect most dealers will order their inventory boats equipped that way. I was impressed by the quality and value of this entry-level boat that could reasonably get many families on the water. As equipped, it is the most popular fishing boat in the G3 line-up; if you want to lower the price even more, it reportedly runs very well with only 90HP. If you don't want your boat looking like every other 175 on the water, a custom wrap is available as a dealer option. This wrap is much more detailed than a normal graphics package and individualizes your boat.